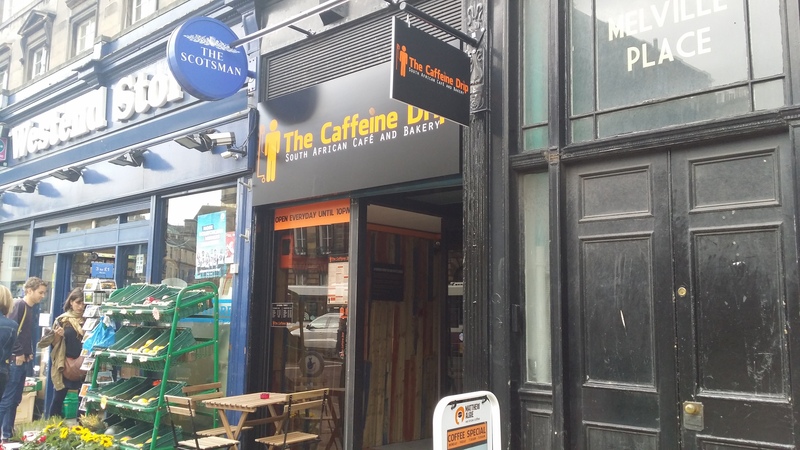 I’d been eyeing the arrival of the Caffeine Drip, a South African cafe and bakery on Queensferry Street, for a wee while, so was glad to find the opportunity for a visit, just a couple of weeks after it opened. 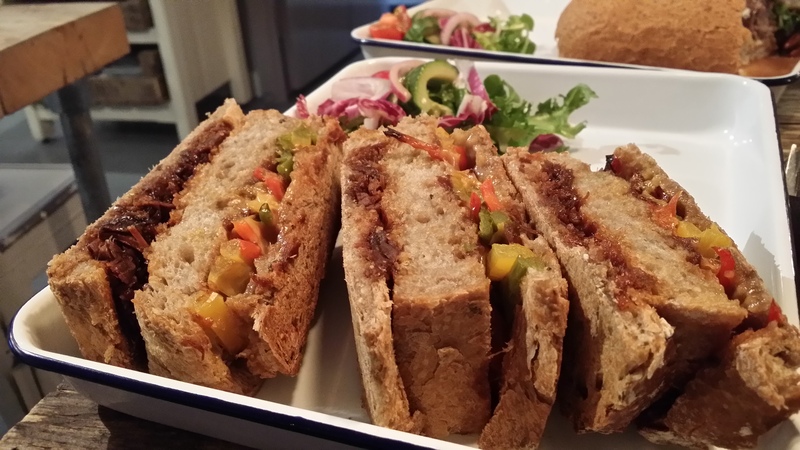 With their takeaway shop open from 7.30am and the downstairs cafe open until 10pm, the place represents a genuine opportunity for evening cafe entertainment focussed on caffeine and baked goods, rather than booze. As such, it’s a potential mind-shift for Edinburgh punters, but one that is entirely welcome. I was joined today by Jane, who had most recently quested to Serrano Manchego where her expert knowledge of Spanish food had come in very handy. Breakfast is served until 11.30am, from which point a generous selection of sandwiches and baked goods are very much to the fore. We opted for soup to start, then I added a club sandwich while Jane added a boerewors roll. 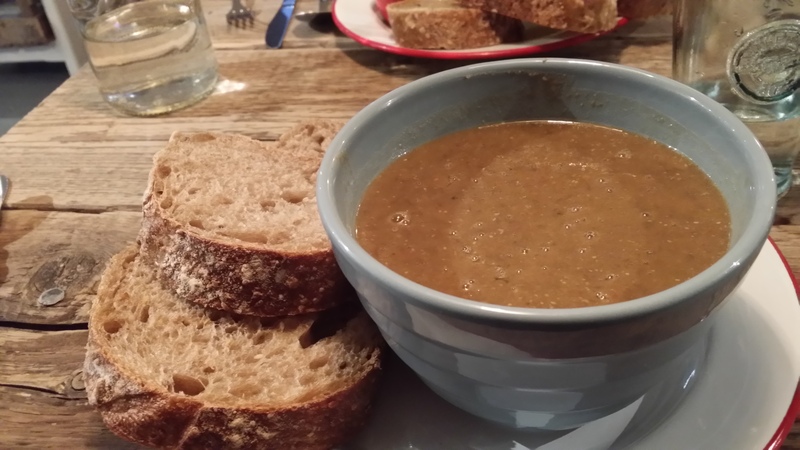 Jane chose the roasted vegetable soup, which was good although it was not the bonniest colour. 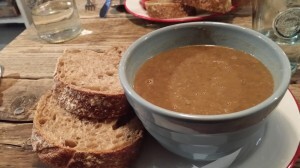 While the same can be said for my brown lentil soup the brown colour was entirely as expected. It was an outstandingly good soup with a nice note of spicy heat and hugely pleasing flavour. It was the best soup I’ve had in a good long while so rightly sits amongst the Soupquest exceptionals. 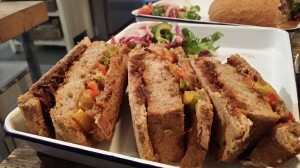 As with the soup, the sandwiches were an impressively generous portion with the bread deliciously fresh. My pulled beef club sandwich verged on being overly sweet, but was a satisfyingly filling eat. Jane was highly impressed with her sausage sandwich, which packed great flavour from gorgonzola and caramelised pecans. 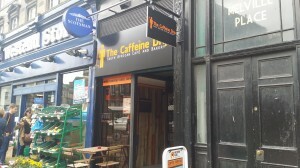 Rather disappointingly for a place with caffeine in its name, the espresso was very ordinary stuff from Matthew Algie. To sustain as a specialist coffee place a change of direction is required on that front. The rest of the drinks menu holds much greater interest, though, and the hot chocolate that Jane tried, from an impressive range of choices, was very good indeed. So overall, the Caffeine Drip is doing very good work. Once the coffee is improved, it was be a highly compelling offering. It’s a wonderful little hidden nook in the West End. I’d recommend a visit. On a rather dreich Monday, we ventured into the underbelly of the Caffeine Drip on Queensferry Street. 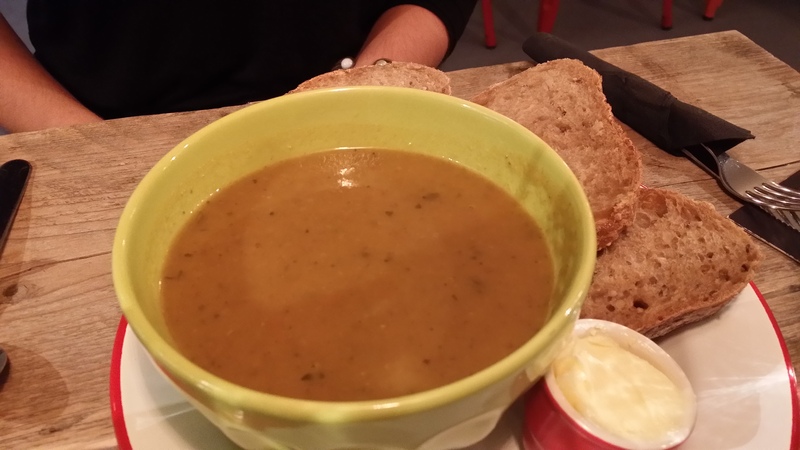 Feeling the cold, a big bowl of soup and warm sandwich was entirely welcome. My roasted vegetable soup was thick and warmed my bones. Tasty as it was, it didn’t resemble my idea of a roasted vegetable soup. I prefer a more vibrant looking Mediterranean soup as described, but as we were in a South African café, this is maybe typical. Blythe’s, on the other hand, was the star of the show and left me with soup envy! 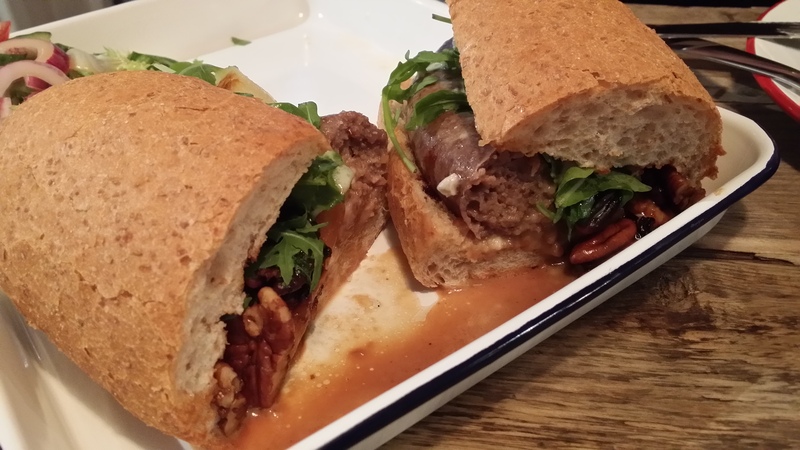 The accompanying boerewors sandwich, with gorgonzola, caramelised pecans and pear was a nice combination. Although perhaps a little overpowered by the toasted nuts, it was one of the best sandwiches I’ve had in a long time. Rather than a coffee, to round off lunch, I fancied something sweet and, being far too full to attempt one of the amazing looking cakes on offer, I opted for one of the extensive hot chocolates on offer, which was perfect. The delicious dark Belgian chocolate was not too sweet or grainy as is often the case. Unfortunately, we were left sitting for a little longer than I would have liked before our plates were cleared, but the staff were pleasant, if not a little disorganised and not very switched on. This is maybe down to teething issues and it hasn’t put me off going back to try more. A great little underground food and coffee cave, perfect for a rainy day…providing they turn the heating up next time!